On the one year anniversary of Bill’s Joshua Tree hike I decided to do something different. Being short on ideas, I decided to play hooky from the Grand Jury for the day and just hike in on the trail from the Juniper Flats trailhead, look at things as Bill presumably saw them and mull everything over. The weather was pretty much identical to the previous year when Bill did his hike, with a high in the low 90’s. I ended up going in just over 5 miles on the trail, to the point where the California Riding and Hiking Trail drops into a canyon to the west. It’s a little past the turnoff to Juniper Flats. I had a look around that area, but no serious searching. This was an “idea” trip. I started earlier than Bill (I started about 8 AM and he about 9:20 or later) and got back to the Juniper Flats trailhead at 12:20 PM with the temperature at sitting at 91 degrees. 1. There was considerable Verizon cell coverage out there, much more than the coverage maps or splash maps let on. I tested it with my new Verizon iPhone 4. On that trail in from the trailhead, when the trail reaches the top of the ridge and you can see over toward the Randolph Ranch, there was one to two bars. This kept up until almost reaching the turn off to Juniper Flats, which is in a depressed area. Continuing on the trail a short ways further, at the rim before it drops to the west, there is also coverage. Now I had no idea where the coverage was coming from. Maybe signal bounce or refraction, or maybe just iPhone magic. But it was there, and if someone needed to make an emergency call or text there were a lot of places it could be done with Verizon. 2. It was friggin’ hot out there. By the time I reached the turn off for Juniper Flats, the idea of scaling the face of Quail Mountain just seemed nuts, even for me. So I didn’t. And if Bill went that route, he was at least an hour later than me, and it would have been hotter. So unless Bill was some sort of crazy, heat-loving super hiker, it just seems highly unlikely he would have attempted an ascent of Quail Mountain under those conditions. 3. It may not be a wise thing to get lost in JTNP. When I started up the trail, there hadn’t been anyone on the route for days. I was leaving glorious tracks, as would have Bill. No one is there in Summer and the winds over the previous week had left a clean slate. If the first responders looking for Bill would have been track smart, they should have easily seen Bill’s tracks. 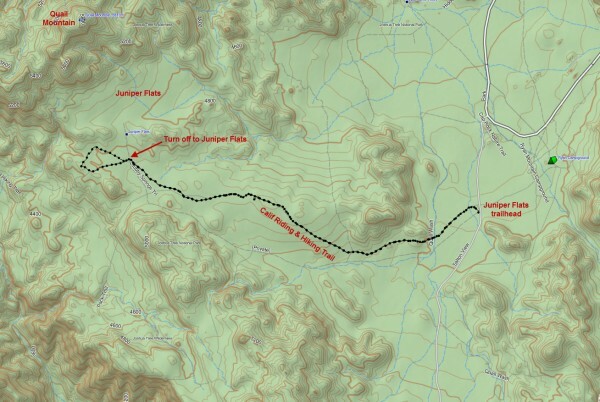 By the time searchers with more tracking sense were assigned to the scene, the route in to Juniper Flats would have been trashed by the very first searchers in. 4. Why did it take until late Saturday to find his car at the trailhead? My vehicle was the only one there all day and stood out like a sore thumb. As I drove by the other trailheads most were empty as well. It’s stinkin’ Summer! Bill’s car should have been spotted within a couple of hours of JTNP being notified, since there was probably little else parked around. 5. The trail turn off for Juniper Flats is somewhat easy to miss if you go in via the hiking trail. If you take the closed road, it heads right to Juniper Flats. But the trail crosses it and it just looks like a wash at that point. Further, there are branches outlining the trail across the intersection, with no encouragement to turn right . And no signage. The trail passes two other trail junctions before reaching the turnoff, and there both have very nice signs. So I think the right turn to Juniper Flats could be missed by someone without much difficulty. 6. I had performed a lot of new cell phone research. I took a screen grab of Verizon’s official coverage map and overlaid it on Google Earth. 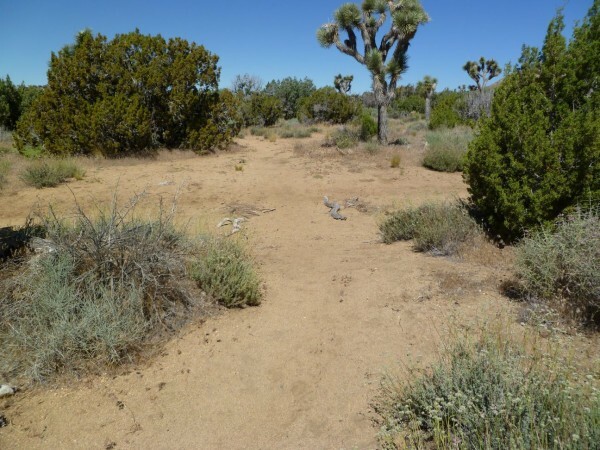 I also identified the locations of about 8 Verizon cell towers surrounding JTNP and did splash maps for each of them. A couple of the Verizon towers did cover the areas we had been searching, including the southeast face of Quail Mountain. That means someone on either side of upper Quail Mountain would have cell coverage for emergencies. Like I said, there’s a lot of Verizon coverage out there. 7. It was beyond me how someone could have a destination presumably of Quail Mountain, and go past it enough to get into the coverage area of the Serin Drive tower without having already called in an emergency. That is the million dollar question. 8. I noted no debris along the trail at all on my in and out trip. Considering the amount of visitation out there this time of year, I think there’s a good chance anything found near the trail could have been Bill’s. It would have been nice if a DNA test on the found bandanna was considered. So this trip seemed to leave me with more questions than I had before I did it.